Together, building and supporting a healthy, resilient and inclusive Jewish community. 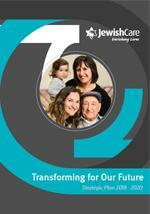 Delivering excellent care and support, underpinned by Jewish values for the community we serve. Jewish Care's values are universal and enduring in nature, but are also particular to the Jewish approach to creating a meaningful life and a strong, cohesive community. Our values define who we are and underpin everything we do. They pervade every aspect of our organisation, informing relationships amongst colleagues, between staff and clients and between our organisation and the wider community. Our foundational values are about people - they provide a moral compass for the way we respond to challenges and the decisions we make. Through client services and program excellence, we treat everyone with consideration and decency and will always act for the good of society. Working together to strengthen our community, to build and support the capacity and resilience of individuals and families. We embrace diversity and work together for a just and equitable society. Behaving ethically, with sensitivity and acting in the best interests of all. 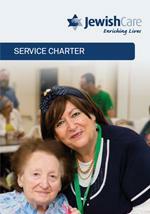 Jewish Care Victoria belongs to the community - each of us owners and stakeholders. With ownership comes responsibility. We each play a role in ensuring the care of those in most need. The strength of our community is in our diversity and in our togetherness - young and old, rich and poor, healthy and sick, religious and unaffiliated. Together we are one. Jewish Care's vision speaks to all of us, not just the vulnerable. Through the delivery of the highest quality of care coupled with real choices and real options, we will transform Jewish Care from a provider of necessity to a provider of choice. First choice for community support.